The H800 has a build envelope of 10 inches wide by 8 inches deep by 8 inches high, while the H400 has a build envelope of 4.7 inches cubed. The plastic filament can be extruded at a variety of layer thicknesses, depending on what combination of print quality and speed is required. The H400 printer can print from 0.15 mm (about .006 in) up to 0.35 mm, while the H800 prints from 0.10 mm (about .005 in) to 0.40 mm. It’s very simple and comes with a step-by-step setup manual. Loading the software, plugging in a USB cable, and importing an STL file are explained thoroughly in the manual. When you first use the machine, use the Auto Platform Level Calibration and Auto Nozzle Height Detection to easily prepare for printing. For more information on the setup process, download the manual, or watch the setup video. Currently, Afinia offers natural, black, red, blue, glow blue, yellow, green, glow green, silver, pink, white, and gold, along with several specialty filaments. You can see all available filaments in our store. 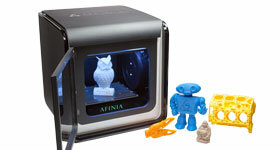 Afinia supplied filaments have been tested and conformed with the H-Series 3D Printer’s specifications. Although other filaments may be used, it is not recommended as some filaments work poorly or can cause damage to the extruder head and machine. The Premium filament has been designed specifically to the specifications of the H-Series 3D printer, the most important being the 260 degree Celsius extrusion temperature. The Value-Line filament has an extrusion temperature range between 210 and 250 degrees Celsius. This range allows for broad support among a number of different 3D printers on the market. For more information, and detailed differences, check out our filaments page.